It’s just now staying warm enough to justify a trip to the beach. For those that are going for more than a day, you want to make sure you have plenty of accessories that will maximize your relaxation time. You don’t want to sit directly on the sand, have your food be eaten by seagulls, or have your drink spill, so you need to take some necessary precautions. Of course, this is also while making sure you don’t go too far overboard, otherwise you’re not really enjoying the outdoors at all. 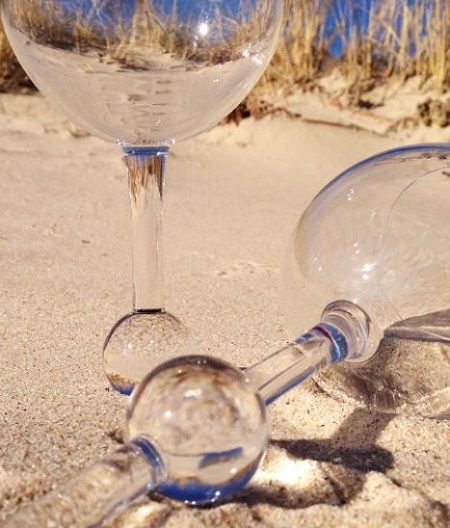 If your biggest concern about your sand and sea vacation is making sure your libations stay in your glass, then you need the Beach Glass. This is literally a wine glass with a spike at the end, that is very similar to a beach umbrella. To make sure that the stem doesn’t go all the way in the ground, which would likely put sand in your drink, there is a little ball that will help prevent it from sinking further than it needs to. This comes in blue, pink, green, white, clear, and amber, each costing $10.50 a piece. For those who are going with a group, this would be a great way to delineate which drink belongs to what person. While they are called glasses, they are actually made of plastic and can be tossed in the dishwasher when you’re done with them for the day.